Mondays may get a bad rap elsewhere, but the Pistachio team loves them. For the last two Mondays, our Technical Educator, Kristyn Otto, has come in early, along with the rest of our team, to teach a class on some exciting new hair cutting techniques. These extensive, 5 hour, 2 part classes are all about perfecting the newest trends by improving cutting accuracy and posture. For most of our stylists, this was a review, but for our new junior stylists it was a valuable chance to learn from some of the most highly trained stylists in the area. 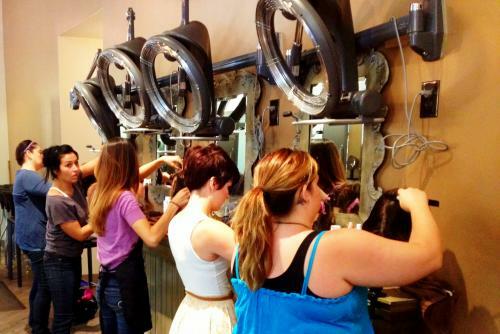 Education is a huge part of our salon, and it’s incredibly gratifying to see these young stylists learning and practicing these fundamental skills.